A method of creating super-nutritious but flatulence-free beans has been developed by scientists. Beans are a cheap and key source of nutrition especially in the developing world, but many people are thought to be put off by anti-social side-effects. A Venezuelan team says fermenting beans with certain friendly bacteria can cut the amount of wind-causing compounds, and boost beans' nutritional value. The research appears in the Journal of the Science of Food and Agriculture. Beans, such as the black bean commonly eaten across Central and Southern America and tested by the team, contain many of these compounds. Researchers from the Simon Bolivar University in Caracas found that by boosting the natural fermentation process by adding a particular type of bacteria , called Lactobacillus casei (L casei), the amount of these indigestible wind-causing compounds were reduced. Soluble fibre was reduced by two thirds and the amount of raffinose, another flatulence-causing substance, by 88.6%. But the amount of insoluble fibre, which is thought to have a beneficial effect on the gut and help the digestive system get rid of toxins, increased by 97.5%. The team concludes that fermentation involving L casei could decrease flatulence compounds and increase nutritional quality. 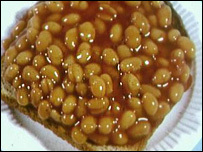 They suggest the bacteria is used by the food industry to create better bean products. The team led by Marisela Granito said: "Given that flatulence is one of the main limiting factors for the consumption of this important foodstuff, the implementation of processes which allow for nutritious and non-flatulence-producing beans to be obtained would be interesting." Dr Frankie Phillips, a nutrition expert and spokeswoman for the British Dietetic Association, said: "This study provides an interesting lead in helping us to overcome some of the less desirable aspects of eating legumes - i.e. flatulence - whilst ensuring that the nutritional benefits from eating them remain. "On a practical note, some people find that gradually increasing consumption levels of legumes helps, as the body adapts, and others have no symptoms at all. "I'd suggest trying small portions of legumes as part of a meal and gradually eating larger portions as they can be tolerated." She said that products existed, mainly in the US, which can help reduce flatulence. She added: "Despite the obvious social concerns, there is no physiological harm from the flatulence caused by eating beans and other legumes, and considerable nutritional benefits from eating them owing to fibre content as well as a wide range of other nutrients and phytonutrients."